The author of this text had a stroke at the age of 10, leaving her with permanent paralysis on her left side. During the 30 years since then, in her determination to overcome her disability, she has come up with novel ways to perform daily tasks. This book is a compilation of the solutions Kate has found to regain her independence, and continue to carry out the activities of daily living. Through pictures and simple written steps, she passes on solutions she has found by experience for activities such as fastening buttons, doing the washing up, opening jars, preparing and cooking food, or lifting babies and children. It is aimed not only at individuals with paralysis but anyone with limited movement of an upper limb due to injury or pain. Although it has limited applicability to the general nurse, it would make an informative read for nurses, occupational therapists and physiotherapists working in rehabilitation settings. It certainly has a place on the shelves of any rehab setting office, with relevant advice that could be offered to patients depending on their individual needs. 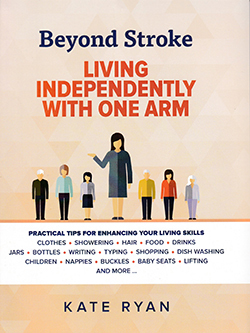 It should also be recommended to patients who have been affected by upper limb disability.